FORT WORTH, Texas (BP) — Adopt a “big God theology,” church planter Heiden Ratner said as the featured speaker during the North American church planting emphasis at Southwestern Baptist Theological Seminary. 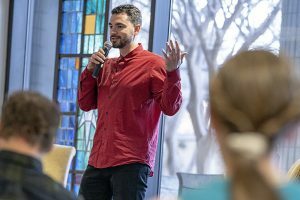 Preaching on “the legacy of God” from Ephesians 3:20-21 during chapel, Ratner underscored the legacy that God has handed down — that He is able and is with His people. View more articles by Alex Sibley.